Where do you do business? If you’re more likely to be out and about than sitting in front of a computer, the QuickBooks mobile app could transform the way you work. The app puts your bills, client payments and reports in the palm of your hand and is fully compatible with the free TaxAssist Accountants app. It can also work wonders when it comes to improving your cash flow. Delayed paperwork slows down the flow of money into your bank. After all, clients won’t pay or commit until they have an invoice or quote from you. With the QuickBooks app you can email estimates, quotes and invoices from the comfort of your car, just as soon as you’ve finished a job. It’s the kind of efficiency that makes you appear more professional and increases the chance of a speedy response. You’ve sent the invoice, now where’s the payment? 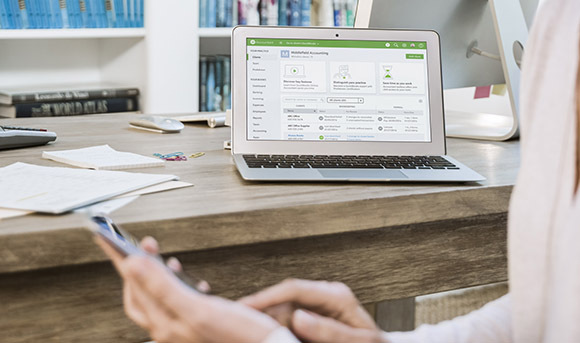 QuickBooks makes the wait far less painful by tracking emailed invoices and letting you know when they’ve been a) sent b) viewed by your customer, and c) paid. If a client hasn't paid you on time, don’t wait until you review your books to find out. The QuickBooks app sends you an alert as soon as an invoice becomes overdue so you can chase it up without delaying things any further. If you have clients who pay in person by cash or card, it’s important to mark their bill as paid to avoid mistakenly chasing them for payment (and potentially losing a valued customer). The app lets you mark their bill as partially or fully paid in seconds, updating your books with a tap. Trying to calculate profits can ruin your day. The app takes away the guesswork and the stress, putting your QuickBooks reports and transactions at your fingertips. And once you know how much profit you’re making from a particular job or client you can focus on getting the work done. We’ve all been there. You buy something for the business then completely forget where you put the receipt. The QuickBooks app can erase that irritation and make sure you’re not out of pocket. Take a photo of your receipt using the app and store it against the correct expense record so it’s easy to find when filing your taxes or accounts. QuickBooks is jam packed with features to help you run your business but some are a lot easier to use on your mobile. Incoming call notifications: When a customer or vendor whose details are in QuickBooks calls you their name will appear on your screen. Directions to customers and suppliers: Work trip? Tap the address in your customer or suppliers QuickBooks record and Google Maps or Apple Maps will direct you. Accept signatures: If you need your client to sign off an invoice, just bring up the invoice on your phone and they can add their signature to it there and then. Their signature will be visible if the invoice is printed off or viewed online in QuickBooks or an email. Notes: Add notes to contact records and jobs in QuickBooks so it’s easier to keep everything organised and in one place. Extra security: Losing your mobile is stressful enough without worrying about someone accessing your financial details. In addition to the bank grade security QuickBooks offers as standard, the mobile app lets you add a PIN (iOS devices) or Gesture (Android devices) to give you extra peace of mind. The QuickBooks app makes using the full QuickBooks software suite even easier and like the TaxAssist Accountants app is free to download* from the Apple Store and Google Play store. You can find out more about QuickBooks from your local TaxAssist Accountant. Book a free consultation today by calling 0800 0523 555 or contact us online and we can demonstrate the software to you. * Please note that a monthly QuickBooks subscription is required to access QuickBooks app features following a free 30-day trial. Please contact your local TaxAssist Accountant for more information about the special discounts we have available for our clients.